Let’s say you’re hiking in Alaska and up ahead, there’s a black bear. It's running at you. It's not slowing down. You packed bear spray for an occasion like this, but what's the best way again for you use it? With bears awake in the Anchorage area, the Anchorage Daily News recently asked wildlife experts and a bear spray manufacturer that question plus others, including: Where should I aim my bear spray? How long should I spray for? How close must the bear be? Here's what they said, followed by a list of places where you can get free training. What is bear spray anyway, and how does it deter bears? 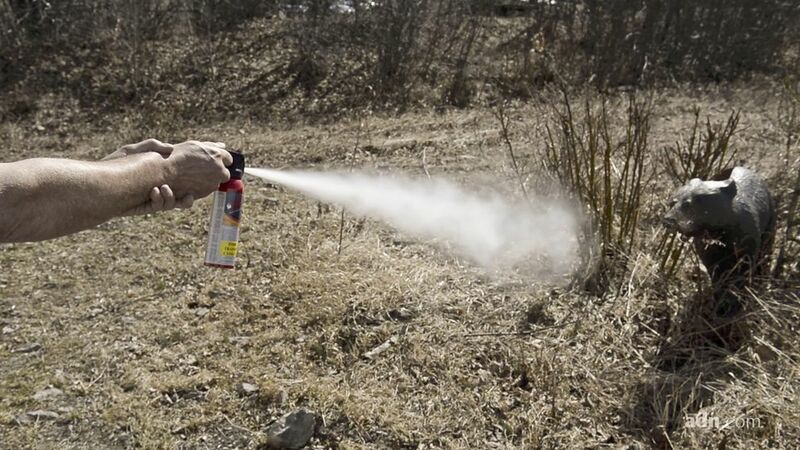 Bear spray has three main components: a potent wax-like extract from a pepper plant, a fluid to dilute it and a propellant to force the mixture out of the canister, said Pride Johnson, president and owner of Montana-based Counter Assault, the oldest manufacturer of bear spray. When you push the trigger, the canister will shoot a roughly 25-foot-long cone of spray into the air, said James Wilder, a wildlife biologist with the U.S. Fish and Wildlife Service in Anchorage. The orange-colored, peppery cloud isn't deadly, but it swells the bear's nasal passages and throat, making it difficult for the animal to breathe, Johnson said. When should I carry bear spray? "All the time," said Mike Taras, a wildlife safety trainer for the Alaska Department of Fish and Game. "There could be bears anywhere on any trail," he said. That includes the trails that snake through urban areas. People should consistently carry their bear spray in the same, easily reachable place. That might be in the pocket of your cargo pants, in a holster around your chest or clipped to your belt. "If it's at the top of your pack where you can't get it in a hurry, it doesn't do you any good," Wilder said. "You don't want to think about it during a stressful situation," Taras said. "You want to be able to just immediately reach for the same place that you're always going to have it." When should I use bear spray? "That's a pretty complex question," Taras said. "It depends on the bear's behavior." Every bear encounter is different and none are typical, said Eric Stuart, school programs coordinator at the BLM Campbell Creek Science Center. Stuart, Wilder, Taras and Johnson said they could speak only in generalities. "Your response should be based on the bear's behavior and not what kind of bear it is," Stuart said. In general, if you come across a brown or black bear and it's acting like it's unaware you're there, you should back away and avoid an encounter. Never run. You don't want the bear to think you're prey, Stuart said. If the bear is aware you're there but it's not approaching you, get your bear spray ready. Take off the safety cap. Talk to the bear calmly. Let it know you're human. Wave your arms above your head, and if you're with a group, stand close to appear larger. Try to back away slowly, Fish and Game advises. If the bear starts walking toward you, quickly determine whether it's a "defensive" or "non-defensive" bear and react accordingly, Stuart said. A bear acting defensively may yawn, salivate, growl, snap its jaws or lay its ears back, Stuart said. Defensive bears include a sow with cubs, a surprised bear or a bear defending a food source, like a moose carcass or even trash. If dealing with a defensive bear, you should continue to talk to it calmly and try to back away, Stuart said. A non-defensive bear is a curious bear or, in the rare case, a predatory bear, he said. The bear will likely walk toward you with more purpose, looking at you intently. You should respond by acting more aggressively. Talk louder. Stomp your feet. Break branches. Throw sticks. If the bear — defensive or not — ignores the noise and continues to approach, it may be time to use your bear spray, Stuart said. "Bear spray is your last line of defense and you use it when, without a doubt in your mind, you feel your life is threatened," he said. A new can of bear spray should reach an animal that's at least 25 feet away. If the bear is farther than that, say 50 feet away, and walking toward you, you can still give it a half-second blast of spray, Johnson said. "It will make a noise that the bear has not heard so it may run away," he said. 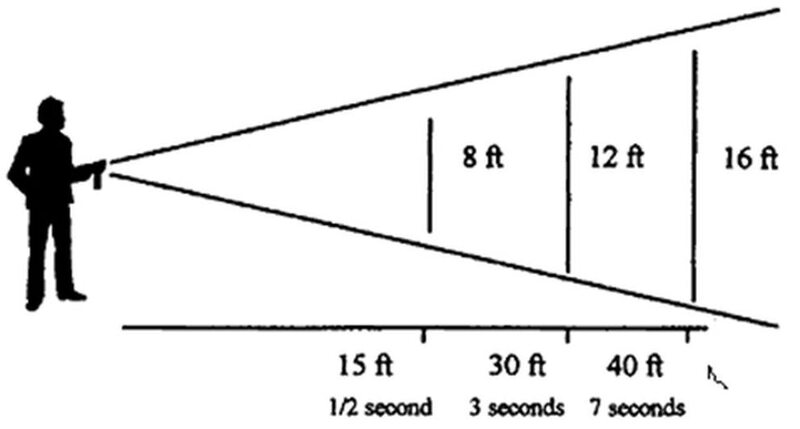 "At the same time, the person can see where the wind is blowing so they can position themselves better." If a bear is running toward you, there probably won't be time to decide if it's a defensive or non-defensive bear, Stuart said. Again, don't run, he cautioned. "You always want to stand your ground and use your deterrent when it gets within range," he said. Stuart, Wilder and Taras all underscored that people should stay in groups and make noise when traveling through Alaska wilderness to avoid surprising a bear and, hopefully, avoid encounters in the first place. "Your first line of defense is just bear etiquette in bear country," Wilder said. "Be polite and let them know you're coming." Bear spray canisters sometimes come with a cable tie around the nozzle. You need to cut off that fastener before you take the canister anywhere, Taras said. If you're outside, and you see a bear and that bear sees you, take off the canister's safety clip. The canister is designed so you can use it with one hand, Taras said. With your thumb, slide off the safety clip. There's an elastic leash on the clip so it doesn't get lost. Point the nozzle toward the bear. Use your thumb to press down the trigger and deploy the spray. At about 30 feet, the cone of spray measures about 12 feet wide by 12 feet tall, Stuart said. "So you don't have to necessarily be an expert firing it because it covers such a large area," Taras said. How long should I spray for? Generally, a one- or two-second burst of spray at first, Taras said. "You don't want to just empty 7 or 9 seconds of your spray — it's not going to make it better," he said. A new can of bear spray generally holds about 7 or 9 seconds of spray, he said. But each brand may differ slightly. The distance covered by the spray also varies slightly between the sizes of canisters and brands. Check your canister's label for those important details, Johnson said. For instance, Counter Assault says its 8.1-ounce canister of bear spray has 7 seconds of spray and covers up to 30 feet. Its 10.2-ounce can has 9 seconds of spray and covers up to 32 feet. You want to affect the bear's respiratory system and its eyes, Taras said. As a bear moves toward you, you should aim the bear spray downward in front of the bear and press the trigger. That way the bear will run into the peppery fog. You want the fog to encompass the animal. "You don't want the bear to go underneath the spray," Taras said. "Always think, 'Aim down, aim down, aim down,' " Stuart said. In the case of a charging bear, Johnson recommended pointing the bear spray toward the ground, in front of the bear, and waving it in a zig-zag pattern, like tracing the letter "Z." "You're painting a barrier," he said. However, Stuart said he advises people to keep it simple and not worry about drawing letters with the spray. "This is going to be a really intense moment," he said. "Just get that pepper out there." Should I do anything else while I'm using the bear spray, like wave my other hand or scream? Just focus on aiming the bear spray and pressing down the trigger, Taras said. "Spraying is good enough," he said. "Spray and then try to get yourself out of the area." What if I'm downwind from a charging bear? The spray is coming out of the canister at about 70 mph, so it will overcome some wind, Taras said. "If you are downwind of a bear, you can still spray that bear," he said. "But you also have to be prepared that you may get some spray on you and it's going to affect you. But you're making a decision: Am I going to spray this animal and get some spray on me and accept the consequence? Or am I going to let the bear approach me or attack me?" What do I do after I use the bear spray? Also, what will the bear do? In some cases, just the sound and sight produced by the burst of orange spray will scare off a bear, Wilder said. However, if it doesn't work the first time, you may have to spray the bear again. "You may have to spray multiple times to stop the behavior so you can quickly leave the area," Stuart said. That's what happened when Wilder encountered a black bear in Kenai Fjords National Park in 2003 while working as a bear biologist, setting up snares in a remote part of the park. It was the one time he was working alone and wasn't carrying a gun. Wilder said the bear came running at him, its nose in the air. He stepped off into the woods. Then the bear stopped near the creek bank, where he had just stood. The bear sniffed a snare, stepped around it and spotted Wilder. It walked toward him. Wilder said he yelled, stomped his feet and threw sticks, but the bear continued to slowly approach. It got within 15 feet, and he sprayed it. "That got it wiping its face but it didn't go away," Wilder said. "So, then I sprayed a pretty big burst and that got me too." Wilder said the spray stung. He coughed. His eyes watered. But the bear left. "I often wonder how that would have been if I didn't have the bear spray," he said. If the bear leaves or if it becomes distracted by the spray, walk away quickly, Taras said. Don't run. Keep your eye on the bear if you can. Johnson said if the bear gets a good dose of the spray it can remain affected for roughly 20 to 30 minutes. After using your bear spray and getting to safety, Stuart said you should call the agency that manages the land you were on and let them know what happened. "If a bear is sprayed, that bear is going to be pretty stressed and it might cause further incidents," he said. If you plan to use your canister of bear spray again, you should wash the nozzle with water so residue does not build up, Taras said. When should I replace my bear spray? If you use up many seconds of the spray, replace it, Taras said. One thing to keep in mind: If you used the spray in a bear encounter, you may not have accurately counted how long you sprayed for. Or you may not have counted at all. That's why Johnson and Stuart said if you use any of the bear spray, you should buy another canister and use the old can as a backup. Each canister also has an expiration date. Pay attention to it and replace when necessary, the experts said. Johnson said his company's products have a four-year shelf life. After that, the propellant will start leaking from the can, creating uncertainty about how far and how long it will spray. 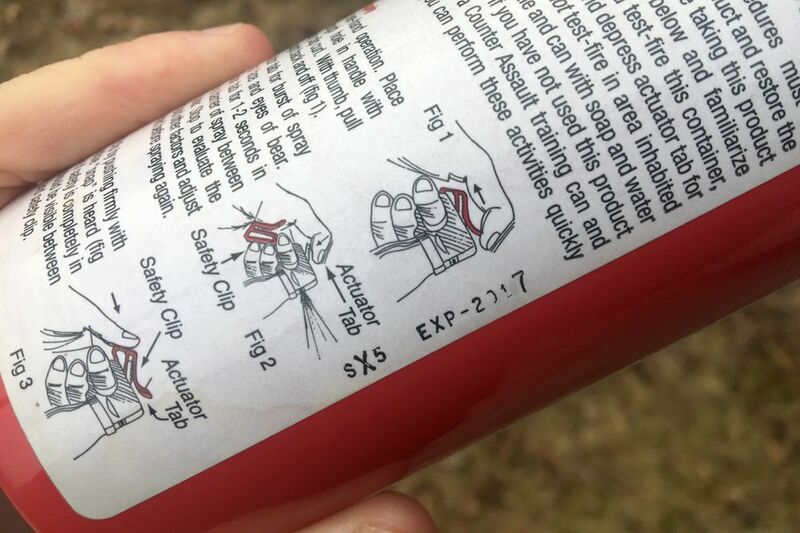 At the start of each spring, you should also inspect your old bear spray canister for any "dings, dents or deformities," Stuart said. If you have access to a scale that measures to the tenth of a gram, he recommended weighing your bear spray right after purchase and then weighing it again at the start of each season to double-check that it's in good condition. In Anchorage, people can dispose of their expired bear spray canisters at the household hazardous waste facilities at both the Anchorage Regional Landfill and Central Transfer Station, said Suzanna Caldwell, Solid Waste Services' recycling coordinator. OK, but does bear spray really work? "We believe that it is effective and it has been proven effective in deterring many bear attacks," Taras said. When researchers studied 72 incidents of people in Alaska using bear spray on "menacing bears" between 1985 and 2006, they found that in close-range encounters with brown bears, bear spray stopped the animal's unwanted behaviors 92 percent of the time. In close-range encounters with black bears, bear spray was 90 percent effective, according to the paper, "Efficacy of Bear Deterrent Spray in Alaska," which Wilder authored along with three others. Of the 175 people involved in the incidents studied, three people received injuries. Those injuries were "relatively minor" and did not require hospitalizations, the paper said. "There are pros and cons to every deterrent and no deterrent is 100 percent effective," Stuart said. He described bear spray as "just one more tool." Wilder said he typically carries both pepper spray and a gun when out in Alaska's backcountry. "People seem to have this 'either/or' mentality about firearms and bear spray and there are these big debates and I don't really understand it," he said. "They're both tools. They both have their place." If I accidentally get sprayed with bear spray, what should I do? First, move out of the area, Stuart said. If you wear contact lenses, immediately take them out. Remember to stay calm, he said. "It's just temporary. It's going to be painful and uncomfortable for a little while," he said. "Reassure yourself that you will be fine." Rinse your affected body parts with cold water, as well as soap if you have it, he said. If you inhale a lot of the spray, you can drink milk to help take the burn away. If you're in the backcountry for several days and your gear gets sprayed with bear spray, you'll want to store that gear away from your campsite, Wilder said. Bear spray residue attracts bears. "It's the same red pepper we use for food and has a strong red pepper smell," Stuart said. "I would treat anything that was sprayed like I would food — bag it up in an airtight container and store it up a tree or away from camp," Wilder said. "If your tent got sprayed, I wouldn't be sleeping in that tent." At what point is playing dead more effective than using bear spray? If you're sure the bear is acting defensively and you've gone through all the response steps — including using bear spray — play dead right before the bear makes contact with you, Stuart advised. "You wouldn't drop to the ground and play dead until half a second before that bear is about to knock you to the ground," he said. "Until you see a paw right in front of your face." Taras said only play dead if a bear grabs you and starts throwing you around. "The only time you ever play dead in a bear attack is if a bear attacks you defensively and it actually makes contact with you," he said. He said sometimes people drop to the ground and play dead too soon, before the bear even gets to them. "That's inappropriate and it causes the bear to come up out of curiosity," he said. Should I use bear spray like mosquito repellant? What?! No! The residue attracts bears. "You don't spray it on yourself. You don't spray it on your tent," Johnson said. "This is not 'Star Trek,' where you can just put this circle around your tent and you have this invisible barrier." Can I use bear spray on other animals? Taras has heard about people using bear spray on other animals such as moose and wolves. "It still affects the respiratory system in a similar manner," he said. However, he said, if you're taking bear spray out in the winter, you need to keep it warm — perhaps in a chest holster underneath a parka. Bear spray generally starts to lose its propellant when temperatures drop below about 10 degrees, he said. How should I store my bear spray? In a cool and dry place that children and pets cannot access, Johnson said. The temperature should not exceed 120 degrees or fall below freezing. You cannot carry bear spray in the cockpit of any type of aircraft, Taras said. You should not leave it in hot vehicles, he said. "If you leave it in your vehicle and, with the sun being out, it gets over 100 degrees, these things could blow," Taras said. "You can YouTube that." To sum it up: When it comes to bear spray, what's your most important tip? When you're outdoors, make sure your bear spray is immediately accessible, Stuart, Johnson, Wilder and Taras said. In a safe place, practice taking the safety cap off. Attend a training session to practice pressing down the trigger on inert bear spray canisters, Stuart said. Too often, people buy bear spray and shove it in their backpacks while outside, but have no idea how to use it, Taras said. You should be able to take off the safety with your eyes closed, he said. If a bear is charging you, everything will happen in 3 or 4 seconds and you should feel confident enough with your bear spray to use it effectively, Johnson said. Where can I practice using bear spray?